Pc Sync Software: Advanced Pc Sync software that offers a complete data mobility solution to sync Outlook, Outlook Express, Windows Mail and all your personal data on a simple mobile device such as a USB key. Free Trial! 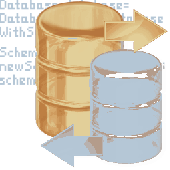 SQL Schema Sync API offers a new approach to DB structure synchronization since this component is integrated into your program. The product is run time royalty free. Full source code is available. A library is developed for SQL Server 2008.